Your Online Website Advertising Partner in Malaysia! Advantages for placing Banner Advertisements? Advantages for placing Ezine Advertisements? The power of Banner Advertisements relies solely on the performance of banners. In performance, we are referring to "Eye-Ball-Click-Through-Conversions" or "Impactfulness". When someone sees a banner advertisement, the ability of it to capture the attention of the web surfer within seconds before he scans the rest of the page is extremely important. If a user does not click on a banner, it should nonetheless try to make such an impact upon him that he will remember the banner advertisement in his subconscious mind. As long as any of the above two situations have been fulfilled, the banner advertisement campaign can be considered a success. How do you capture attention? Just as important as a Banner's Design is to capture attention, Banner Placement should also be considered seriously. With a fantastically designed banner, it is still of no use if the user is not able to see the banner. Apart from being placed in a prime location on a web page, it also has to be placed in a location with high traffic flow under sections with high relevance. 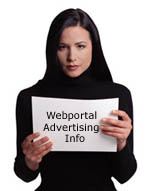 Based on the above requirements & suggestions, Webportal.com.my would be able to help you deliver your message across to the correct target audience based on its wide array of interests & sections without wasting any of your resources in wasted banner ads.